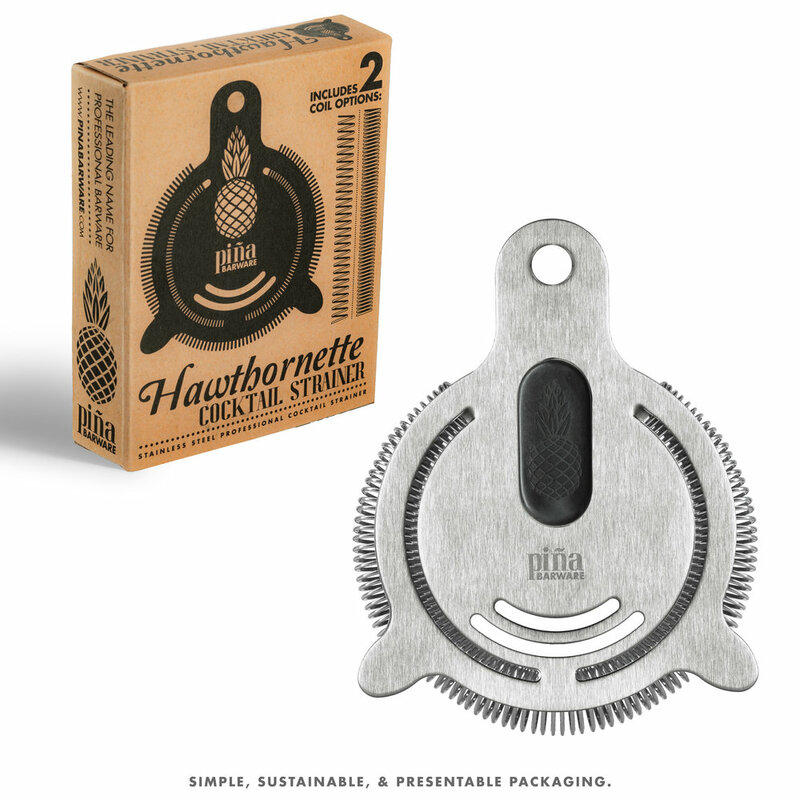 Piña Barware's "Hawthornette" strainer was designed for professional use. The Piña "Hawthornette" includes several features that make it perfect for working bartenders. INCLUDES TWO COILS WITH EACH STRAINER • With the tighter coil, the strainer effectively strains your cocktail from many types of shaking and mixing containers by blocking smaller ice and sediment than most others on the market. With the looser coil, the strainer allows a fast flow for pouring cocktails quickly. Easily swap the coils whenever you’d like. DURABLE CONSTRUCTION • The strainer is built with brushed-finish 304 Stainless Steel with a food-grade rubber grip. It's built to last many years behind even the busiest bar. SIMPLE DESIGN • With a simple two-piece construction, the Piña "Hawthornette" allows quick and efficient cleaning by easily removing the stainless steel coil. Practical Design. Each strainer includes two coils to choose your pour speed, and a non-slip rubber finger rest helps you keep your cocktails where you want them. Maximum Durability. Made from the highest quality brushed-finish 100% stainless steel and fully dishwasher safe.